We are pleased to formally announce Pro Walk/Pro Bike/Pro Place 19, scheduled for September 12-15 at the Sheraton Wall Centre in Vancouver, BC. For those of you who are unfamiliar, this biennial conference is the premiere active transportation gathering in North America. More than 1,000 city planners, transportation engineers, public health professionals, elected officials, community leaders, and professional walking and bicycling advocates are expected to participate. The mission of Pro Walk/Pro Bike/Pro Place is to connect those who are working hard to create engaging places that are walkable and bike-friendly. Our meeting in Vancouver will build upon the momentum gained in Pittsburgh, PA, where we last gathered. That conference saw record attendance and our most complete program to date, with over hundred breakout sessions, plenaries, poster sessions, mobile workshops and Pecha Kuchas that captured the latest trends and best practices in bicycle/pedestrian infrastructure design, education, and advocacy. In 2014, we were also delighted by the attendance of speakers like Secretary Foxx (USDOT), Gil Penalosa, (8-80 Cities), and Mayor AC Wharton (Memphis, TN). Mayor Wharton, in particular, stood-out by describing Memphis’ transformation from one of the worst cycling cities in North America to a city that is shaping to develop the most comprehensive and largest contiguous complete streets model in the United States. In 2016, we shift our conference to Vancouver, BC, which is consistently ranked as the most livable city in North America. This ranking reflects the city’s natural beauty and its commitment to people and places. At a time when most cities turned to the automobile, Vancouver worked hard to preserve its urban walkable core, and encouraged the development of dense mixed-used neighborhoods. In recent years, Vancouver developed one of the most progressive active transportation infrastructure in North America, and in 2015 met its 2040 goal of reaching an active transportation mode share of 50 percent of all trips! Vancouver has much to teach us, which is why we are making our mobile workshop series integral to this year’s conference. We like to think of Vancouver as a virtual classroom, and we want our conference delegates to experience everything the city has to offer. For 2016, we will be offering mobile workshops that are longer, more immersive and more hands-on. Protected Bikeway Tour. 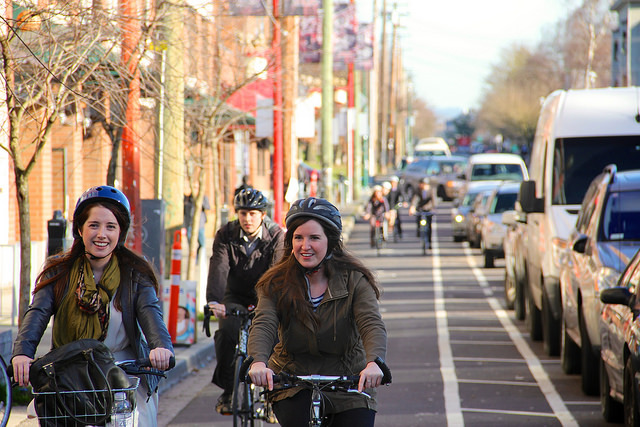 Join the City of Vancouver Transportation Design Staff for a bike tour of the city’s recent innovative cycling infrastructure, focusing on protected intersections and bike lanes. Surrey - Retrofitting Suburbia. City of Surrey staff will take delegates downtown to showcase the new Surrey City Hall, library, and shopping center. Workshop participants will learn more about the challenges associated with retrofitting suburbia and civic and institutional investment. BC Parkway Bike Tour. Led by HUB Cycling, this 26km (16m) bike tour will take delegates to three neighboring suburbs, and expose participants to Vancouver’s TransLink system and its robust network of transit-oriented developments along the route. Commercial Drive: Evolution of a Vancouver High Street. 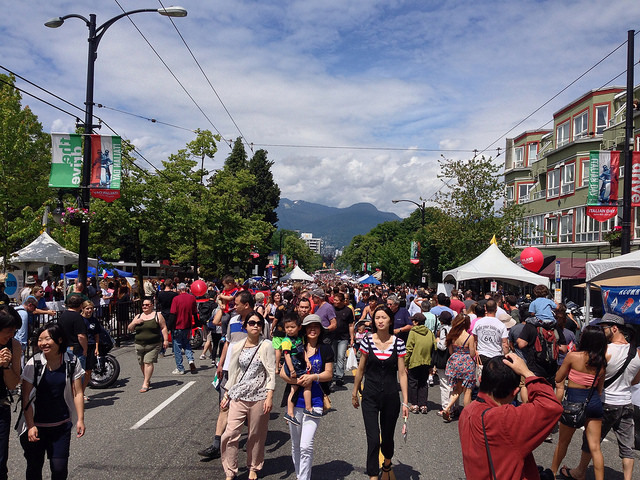 City of Vancouver staff will lead a walking tour through the Commercial Drive corridor, one of Vancouver’s most cherished commercial streets and the heart of the Grandview-Woodland neighborhood. Delegates will learn more about the “The Drive’s” history, culture, and understand why it was voted as one of Vancouver’s top ten public spaces. Evergreen Line Skytrain Tour. City of Coquitlam staff will lead a tour of the Evergreen Line extension of Metro Vancouver’s SkyTrain system. Delegates will learn more about construction of the new transit line as well as improved walking and cycling facilities that link the transit stations with key destinations. Places and Spaces of the West End. City of Vancouver staff will lead a walking tour exploring the West End, one Vancouver’s most culturally diverse neighborhoods, and a social hub for the LGTBQ community. Delegates will learn more about recently created West End parklets and plazas, mini community gardens, and Vancouver’s food truck program. Secure Bike Parking: Bike Tour of End of Trip Facilities. Led by HUB Cycling, this bike tour will explore Vancouver’s innovative bike parking facilities that go above and beyond offering riders security, but also provide showers, lockers, and change facilities. This list is just a sampling, and we will have a more finalized list of workshops in the future. To stay current with all conference-related news, sign up for mailing list. We hope to see you in Vancouver!